The Cranbrook Quiz Bowl Team had an impressive day at the National Academic Quiz Tournaments (NAQT) State Qualifier. Six students traveled to the University of Michigan on Saturday, March 30th to compete as one of 23 teams in attendance at the tournament. Improving on their placement in previous years (8th in 2017 and 7th in 2018), the CK Quiz Bowl team took 5th place overall, finishing the tournament with a 7-4 record. Additional accolades were earned by team member Alex Stamell, who finished the pool play round as the third-place overall player in Michigan. 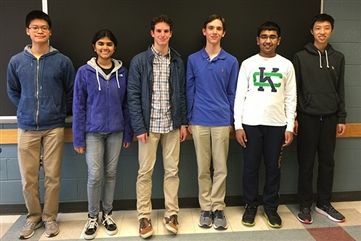 Another highlight of the tournament was the CK team’s defeat of the Grosse Pointe South team, the latter which lost only two rounds—one of which the CK team is proud to claim! Their winnings were due in large part to Daniel Liang's top performance in the match. Many congratulations to the team for these accomplishments!